7-Eleven brings a total of 4 Classic Disney characters, Dumbo, Pinocchio, Alice in Wonderland and Bambi to form a set of eight pouches, taking you through a journey to revisit your childhood dreams! Redeem one pouch randomly▲ with 18 stamps plus a donation of $1*, or 5 stamps plus HK$22. ▲All items are distributed randomly and are non-exchangeable. 1. Stamp issuance period: 17th April 2019 7a.m. to 28th May 2019. 2. Classic Disney Pouch redemption period: 17th April 2019 7a.m. to 31st May 2019. 4. Redeem one Classic Disney Pouch with 18 stamps plus $1 donation or 5 stamps plus HK$22. 5. All redemption items are pre-packed and are redeemed randomly; customers are not allowed to choose. 6. The stamp card will be collected upon all items redemption, additional stamps cannot be returned. 7. Awarded stamps will be counted and distributed at cashier for every transaction, no claim is allowed afterwards. 8. Stamps are counted on a per transaction basis. All damage, smudge and forge are treated as void stamps, and will not be accepted. 9. Stamps must be returned together with any product refund or return. 10. Only intact, true copied and photocopied stamp cards are accepted, all other versions are invalid. 11. The product quantity at the store shall prevail. Each customer is eligible to redeem a maximum of 20pcs of Classic Disney Pouches and 2pcs of limited edition items in stock per day. Ordering is available when the redemption quantity of Classic Disney Pouches exceeds 20pcs. Pick up date of ordering items is subjected to stock availability. Please contact our store staffs for details. 12. Limited Edition items are available while stocks last. No ordering is available. 13. Transaction at shops at Inspiration Lake Recreation Center and Team Disney, Hong Kong Disney Resort are excluded. 14. 7-Eleven reserves the right of final decision in case of any disputes. #Purchase of cigarettes, milk powder, online game products (except the specific products from the promotion), redemption items and other services, e.g. Octopus reloading / last 10 transactions print out, Macau Pass add-value, e-wallet top up, bill payment / remittance / donation, purchase of gift card / pre-paid card / subscription card / Octopus Card / Octopus Ornament / Macau Pass card / mobile pre-paid SIM card or recharge voucher / redemption items, products of vending machine, ticketing service / stamps, photocopy / fax, battery recharge service, parcel pick-up and return, pre-payment, locker / shoe repairing / key duplication, Inspiration Lake activities / parking fee payment and self-serve laundry service are excluded from spending amount. A set of eight travel pouches are designed in three different styles, shapes, sizes and capacities, ready to meet your needs. The translucent pouch designs allow visibility, so your items can be clearly displayed without the need to unzip! The rectangular series comes in 4 styles, with characters including Bambi, Pinocchio, Alice in Wonderland and Dumbo. The zipperhead is designed with a cute 3D figurine, with which the bag can be unzipped and opened. The pouch is designed with 2.5D graphics which makes the classic scenes look more three-dimensional. It can hold passports, identification cards, tickets and other small items, which are suitable for travellers, and the different styles can even hold and separate different currencies! It is convenient and practical, which can also act as a little bag to put your wallet or mobile phone. The round series comes in 2 styles - Bambi and Dumbo. The pouch is designed with a cute 3D zipperhead - Bambi or Dumbo, and the characters are wandering around, exactly like how they appear in the story scenes. Just grab the 3D figurine zipperhead and you can unzip the pouch easily. This is also fit for students and travellers, as it can store stationery, portable skin-care products or cosmetics. The cylindrical design also makes it easy to carry tube-shaped items, such as combs or travel-sized toothpaste and toothbrushes. The oval series comes in 2 styles, namely Alice in Wonderland and Pinocchio. The pouch is designed with a snap button design, which enables easy opening and closing. The 3D figurine is embedded inside the pouch, so the transparent design makes Alice and Pinocchio appear like they are living in a vivid fairytale. The pouch is divided into multi compartments, which is suitable to hold little items, such as accessories, USB, charging wire etc., enhancing its practicality. 7-Eleven held the “A Childhood Dream Come True” activity at the Causeway Bay Yee Wo Street store. Bambi, Pinocchio, Alice in Wonderland and Dumbo all gathered for a fantastic journey! 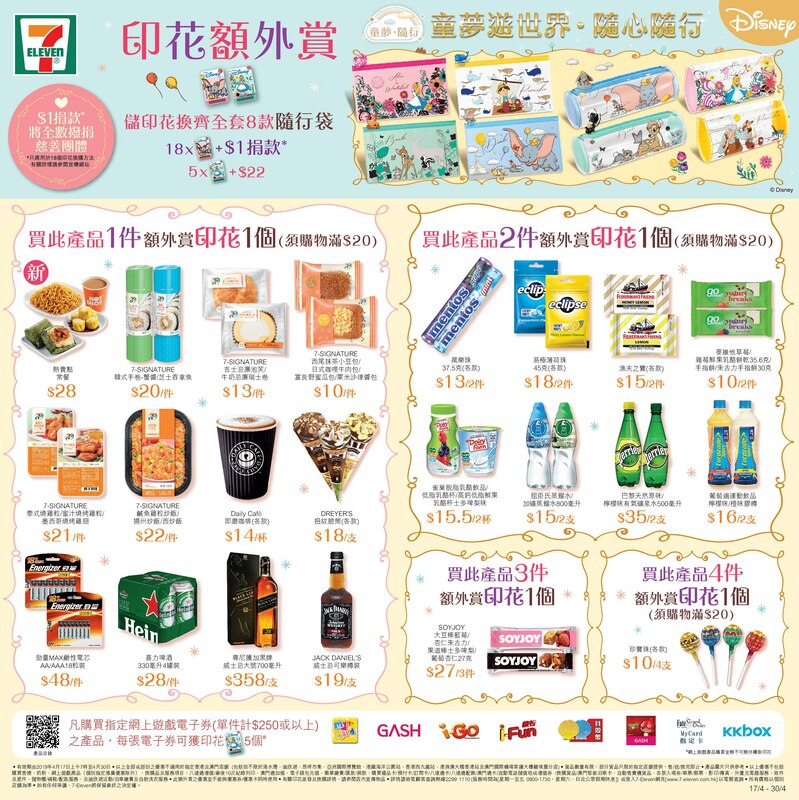 7-Eleven donated all the proceeds+ (from 12nn- 1pm) at the Yee Wo Street store to the Little Life Warriors Society, allowing customers to participate in charity during shopping. +Does not include proceeds from cigarettes, milk powder, online game products (except the specific products from the promotion), redemption items and other services, e.g. Octopus reloading / last 10 transactions print out, Macau Pass add-value, e-wallet top up, bill payment / remittance / donation, purchase of gift card / pre-paid card / subscription card / Octopus Card / Octopus Ornament / Macau Pass card / mobile pre-paid SIM card or recharge voucher / redemption items, products of vending machine, ticketing service / stamps, photocopy / fax, battery recharge service, parcel pick-up and return, pre-payment, locker / shoe repairing / key duplication, Inspiration Lake activities / parking fee payment and self-serve laundry service.